For the second year in a row, the readers of Automotive Fleet magazine have named the RAM 1500 as their 2015 Fleet Truck of the Year. Reader input was heavily weighted in this award, making it back-to-back titles for the RAM 1500 pickup truck. But it wasn’t just the everyday readers of Automotive Fleet magazine that factored into the decision. Commercial fleet managers from around the country voiced their support for the RAM 1500 above the rest of the competition. The RAM 1500 fit the needs of the readers, which includes effectiveness, quality, durability, maintenance and lifecycle costs, servicing and more. More than 40 trucks were on the ballot for the readers and fleet managers to select, and the RAM 1500 emerged victorious once again. 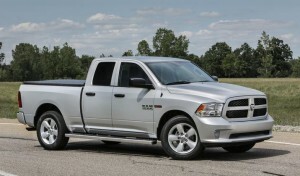 When paired up with the EcoDiesel engine, 2016 RAM 1500 owners will get best-in-class fuel economy of up to 29 mpg. RAM 1500 trucks are award-winning, and an accolade such as this for the 2016 model year already puts RAM ahead of the competition. To learn more about what a new RAM 1500 fleet can do for your Atlanta business or to schedule test drives, contact Atlanta Commercial Trucks online today or give us a call at 855-971-9571.